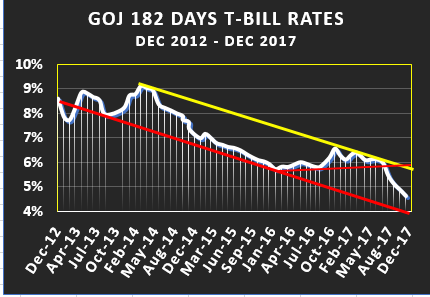 Treasury bill rates in Jamaica continues to fall with the two latest issues of 91 and 182 days duration declining with the 91 days instrument falling to an average of 4.176 percent while the 182 days fell to 4.635 percent. The December decline, is the eight time in 2017, that the rates have fallen. Two amounts of $600 million each were offered to investors and $4 billion chased after them, with the longer dated issue attracting just over 56 percent of the total. The trend suggests that rates on the longer term instrument should fall below 4 percent in early 2018. The effect of downward movement of rates goes much further than just the money market. Stocks and real estate investments are set to rise in value as a result of the continuing fall in rates and mortgages rates should fall as well. 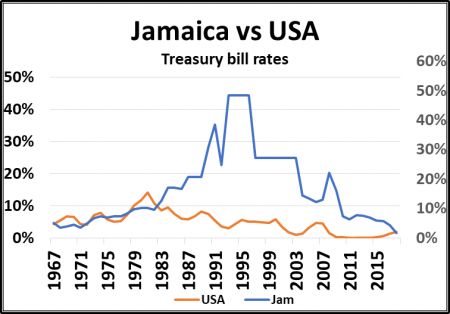 Lower interest rates make real assets more valuable than before, as such the biggest change to stocks this coming week may well be guided by the recent cut in interest rates, with Treasury bill rates falling and the Bank of Jamaica cutting its overnight rate by 25 basis points. 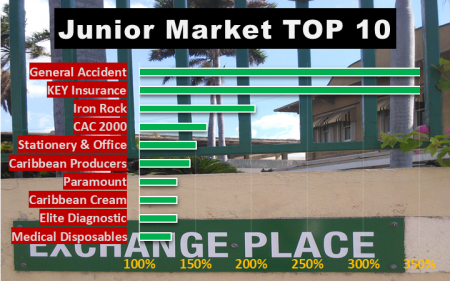 At the close of last week, Caribbean Cream closed at $6.20 and helped to return it to the TOP 10 list, replacing Lasco Financial with its price rising to $4 from $3.40. 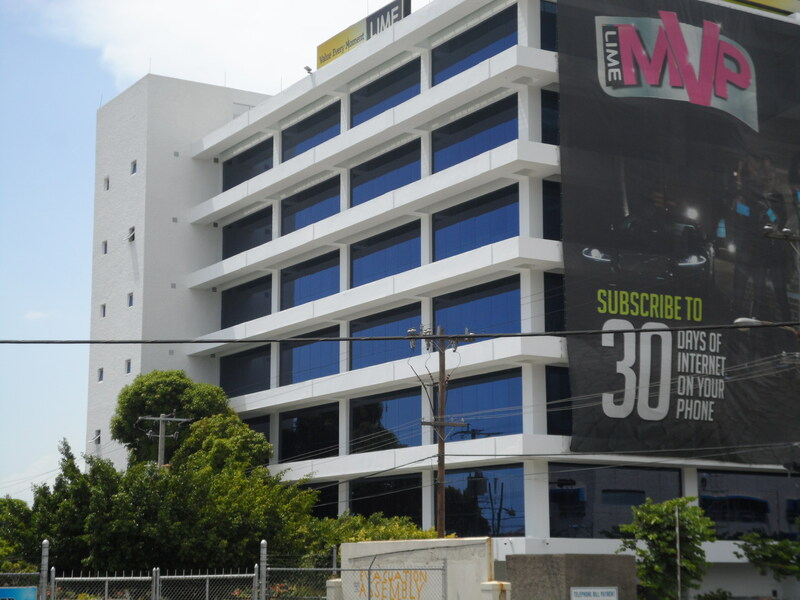 There were no other change to the two listings at the close of the week, even as the main market of the Jamaica Stock Exchange closed to week at record new high. 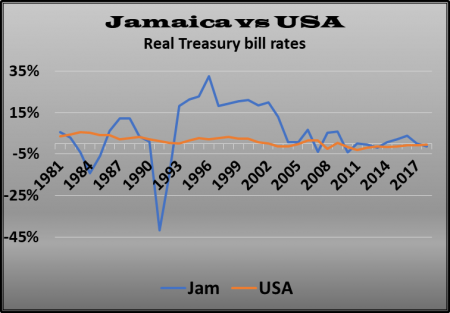 For the coming week the cut in interest rates by Bank of Jamaica as well as a fall in the most recent Treasury rates could well positively impact prices. 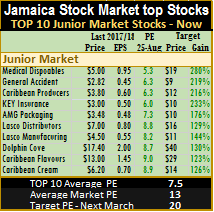 The average PE ratio for the Junior Market Top stocks is at 7.5 and the PE for the main market TOP 10, ends the week at 7.3. The average PE for the overall main market trades at 13.6 and 13.3 for Junior Market, based on 2017 estimated earnings. 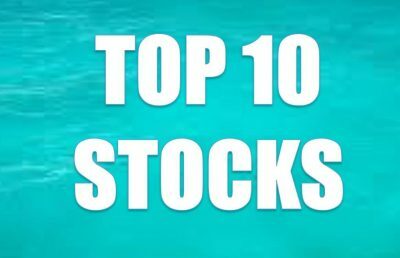 At the close of the week, IC Insider.com’s TOP 10 stocks now trade at an average discount of 44 percent to the average of the market for Junior Market Top stocks and it remains at 46 percent for the main market. 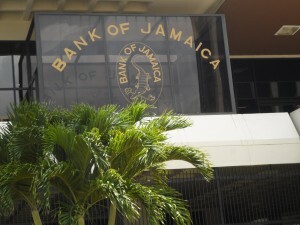 Bank of Jamaica announced a cut in its Certificate of Deposit rate to take effect on May 31, accordingly, the rate offered on its benchmark 30-day Certificate of Deposit will be reduced to 5 percent from 5.25 percent. The rate was last reduced from 5.50 percent to 5.25 on August 18, 2015. The reduction follows falls in Treasury bill rates that are now just ahead of the pre adjusted CD rate. Grace Kennedy reported flat profits for the 2014 year although revenues grew 20 percent for the year to reach $83.5 billion. Grace ended with net profits of $3.29 billion compared with $3.22 billion due to shareholders of the group. Not even lower taxes that delivered savings of $200 million could push the performance that saw lower pretax profit of $4.85 billion versus $5 billion in 2013. Gross profit climbed from $64 billion to $74.9 billion but profit margin declined to 4.13 percent from 5.23 percent in 2013. 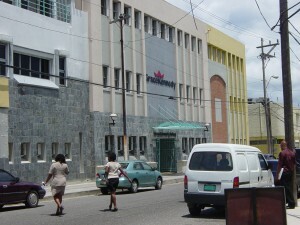 Frank James Group Chief Financial Officer attributed some of the decline to one off cost associated with the acquisition of the Le Fe subsidiary during the year and tightness in the local economy that placed pressure on the margin as the devaluation to the local currency pushed up cost which they were not able to pass on in full. But there is more to it than that. Grace’s segment results showed no growth in segment profits between the September and December quarters, in food trading and insurance, two important profit areas of the group. 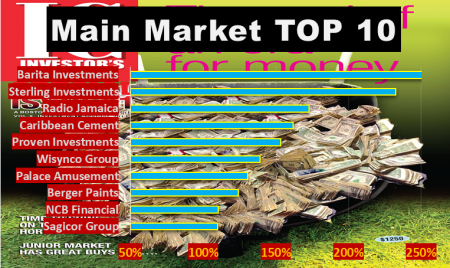 Profit in the last quarter was make primarily by Hardware and Lumber and money transfer. Results for segments were mixed with money transfer ending with $2.39 billion up from $1.9 billion, Insurance rose from $122 million to $454 million. Food retailing ended at $875 million from $1.145 billion in 2013 and hardware & Lumber reported $284 million versus $343 million in 2013. The group reported earnings of $9.90 per share and announced an interim dividend of 75 cents per share payable on May 18, 2015 to shareholders on record as at April 28 with the ex-dividend date being April 24. Return on equity for the group is only 9.5 percent a relatively low rate in a country where Treasury bill rates were close to that level during the year. Graph showing market breaking resistance at 82,000, yellow line on the way to 91,000 points brown line. The main market had 11 stocks gaining at the last traded prices and only 1 declining, at the end of trading, pushing the market indices to their highest point since early May this year. 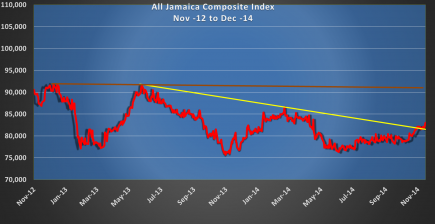 Technically, the market has broken through resistance at 82,000 points on the all Jamaica Index on the November 19, retreated a bit but seems to be moving away from that point now. The next target is 91,000 points, the level reached in December 2012, which could well be reached by year end. The latest break of the 82,000 is the first of three attempts that the market has made to break through the descending trendline going back to late 2011 that has been successful. Supporting the move upwards, is the crossover of the short-term moving average line over the medium term moving average, the shortage of supply of most stocks and the lowering on Treasury bill rates, starting earlier this year and continuing up to the latest auction in November. In trading on Friday, Grace Kennedy was the leading stock trading on Friday with 2 million units with a value of $120.7 million this was followed by Scotia Group with 258,000 shares valued at $5.2 million and Carreras with 123,000 units with a value of $4.5 million. Gains| The stocks ending with gains on Friday are, Caribbean Cement ending with 1,164 units trading with a gain of 4 cents at $2.44. 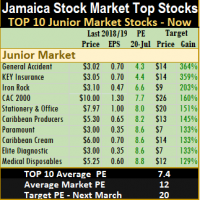 Carreras completed trading with 123,082 shares, the price rose 1 cent to $37, Desnoes & Geddes saw trading in 29,970 units and put on 9 cents to $4.69, Jamaica Broilers concluded trading with 11,700 shares changing hands with a gain of 5 cents to $4.05. 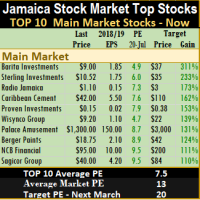 Jamaica Stock Exchange concluded trading with 7,000 units, to close with a gain of 7 cents to $1.57, National Commercial Bank closed with 13,210 units and put on 4 cents to $18.20, Sagicor Group finished with 67,188 shares to end with an increase of 3 cents at $9.93. Sagicor Real Estate Fund ended with 750 shares as the price gained 44 cents to $7.25, a new 52 weeks high, Scotia Group finished trading with 257,719 shares, the price jumped 49 cents to $20.50, Seprod contributed 819 shares as the price climbed 1 cent to $12.01 and Supreme Ventures ended trading with 40,000 shares traded with a gain of 5 cents to $1.95. Firm| The stocks in the main market to close without a change in the last traded prices are, Grace Kennedy ended with 2,009,457 shares changing hands to close at $62 and Hardware & Lumber with only 500 shares trading, closed at $6.50. 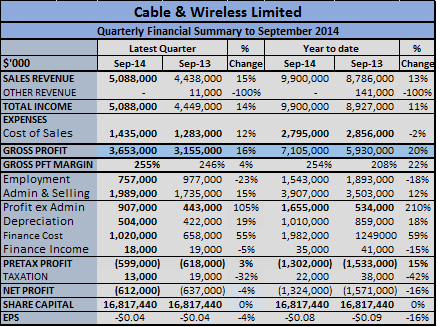 Declines| Cable & Wireless was the only main market stock to fall with a 1 cents loss to 44 cents with1,363 units. 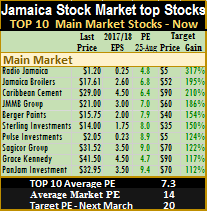 Preference| Jamaica Money Market Brokers 7.50% preference share traded 4,000 shares trading at $2. Cable & Wireless 57 percent to 44 cents as the price responded to news of the parent company acquiring Columbus Communication, operator of the Flow brand. The company also reported much improved cellular customer acquisition for the six months to September and a 15 percent jump in revenues compared with 11 percent in the first quarter. At the same time, profit before finance cost moved from a loss of $179 million in the six months to September, to a profit of $645 million. Higher finance cost, jumped from $730 million to $1.98 billion for the six months, from the year before, resulting in a similar loss as in 2103 of $600 million for the quarter and $250 million lower than in 2013 for the six months, to end at $1.32 billion. Mobile subscribers grew by 125,000 during the April to September period and Mobile traffic increased by 34 percent and mobile service revenue is up 38 percent, the company reported.At the end of March Cable & Wireless stated that they had 705,000 mobile customers. The increase since March, puts active mobile customers at roughly 830,000, by the end of September. At the end of June this year, Mobile subscriber base increased by 37 percent with revenue increasing by 34 percent, broadband base increased by 12 percent with revenue up 39 percent. The continued strong growth in mobile customers is resulting in increased revenues for the local company, moving them closer to a break-even point. The company cut employment cost sharply for both the quarter and six months but increased marketing spend to push various mobile and internet plans and boost the customer base, which should redound to benefit increased revenues, going forward. The second half of the year is more profitable for the company, with the revenue to be booked for the telephone directories and lower marketing cost in the final quarter of the year. Lower Treasury bill rates should see the interest rate that is used to book interest, being lowered by almost 25 percent compared with the first half of the year. IC Insider is projecting a profit in 2015/16 as revenues should continue the strong growth with the push to capture a larger portion of the cellular market and the double benefit of lower out payment cost per customer as the base grows and increase revenue from voice and data. 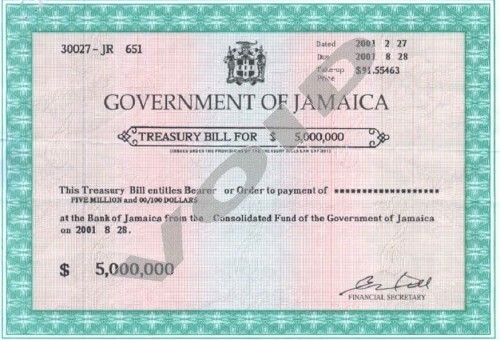 New issues of Treasury Bills are offered on a regular basis by governments all over the world, to fund their short term financial obligations, but not everyone knows how the income payable on them are computed. Unlike regular bonds where the rate of interest to be paid is stated on the face of the instrument, that is not the case with treasury bills. . The bills are usually of 30 days, 90 days, 182 days and 365-days duration but may vary by a day or two in each case. The rate of interest paid on these instruments is determined by an auction system. At these auctions investors predetermine what rate of interest they want and made an offer in writing ahead of the closing time prior to the bids being opened. The lowest rates are satisfied first. If the amount offered for sale by the government is oversubscribed, then those with rates that are higher than the rates on those amounts that equate to the amount offered, are rejected. ((face value-purchase price)/face value) x (365/term) x 100 = discount rate. Using this example the discount rate for an instrument of 91 days will be computed as follows: ((100-97)/100) x (365/91) x 100 = 12.03%. ((face value-purchase price)/purchase price) x (365/term) x 100 = yield. The annualized yield, or the actual rate of return per year, is calculated as follows: ((100-97)/97) x (365/91) x 100 = 12.41%. The amount of treasury bills offered, are published by the central banks who act on behalf of the governments and may be purchased either directly by investors or through brokers. There are usually set dates each month for these issues. Information published for each tender are those relating to the dates of issue, maturity, the closing and settlement.